Are you looking for the next leap forward in your PR career? 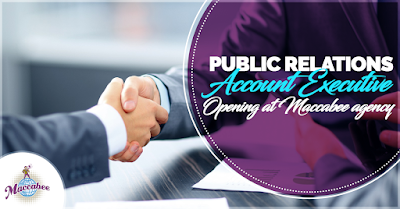 Minneapolis-based Maccabee Public Relations -- a four-time winner of Minnesota Business magazine’s “100 Best Places To Work” – has an opening for a PR Account Executive with outstanding writing and media relations pitching abilities. Could it be you? Can-do positive attitude, with a take-no-prisoners attention to detail. So what will you learn at Maccabee? Cutting-edge PR, content creation and social media marketing skills. What it’s like to be inspired by a purpose-driven team of boldly creative, client service-obsessed partners. The positive impact you can have on clients and co-workers when you’re working at a relentlessly ethical PR agency.